IRS Tea Party scandal: The White House is vague on timing. … And When Did He Know It? 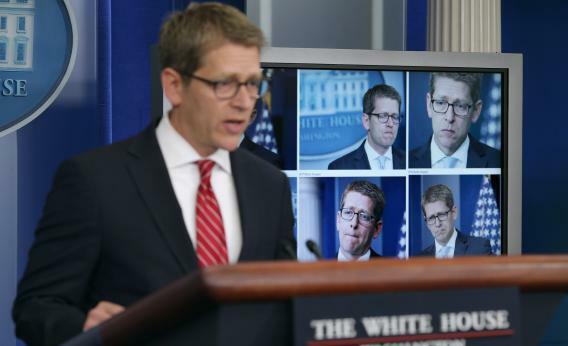 White House press secretary Jay Carney displays photographs of himself before taking questions from reporters on May 15, 2013. Why didn’t anything come from this? Reporters (myself included) didn’t follow up. Republicans didn’t make a great fuss about it—and one of the frequent failures of the political press is that it doesn’t see the heat on a story until one party complains. They knew before last week! That’s the scandal birthed by this story by Peter Nicholas, who reports that the White House counsel was informed of the basics of the IRS investigation on April 22. Nailing a White House on when it learned of a scandal is a time-tested tradition. In May 2011, Eric Holder said he’d “probably heard about Fast and Furious for the first time over the last few weeks.” He’d gotten memos about the scandal for months. The White House has adapted and learned. Here’s how Jay Carney handled a “timing” question last week. Q: I want to follow up on the IRS. I still don’t quite understand the timeline. We had members of Congress complaining about this for two years. Did it just never reach you guys here at the White House that there was these complaints that conservative groups felt that they were being singled out and targeted at any point in time? MR. CARNEY: I’m not sure that people – I’m sure people were aware of and knew some of the stories that had been reported about the complaints, but we were not aware of any activity or of any review conducted by the Inspector General until several weeks ago. Several weeks? April 22? Close enough, probably. That leaves us with the theoretical scandal—maybe Obama’s rhetoric convinced the IRS to go buck wild on the Tea Party!—as the best kindling for Republican activists.